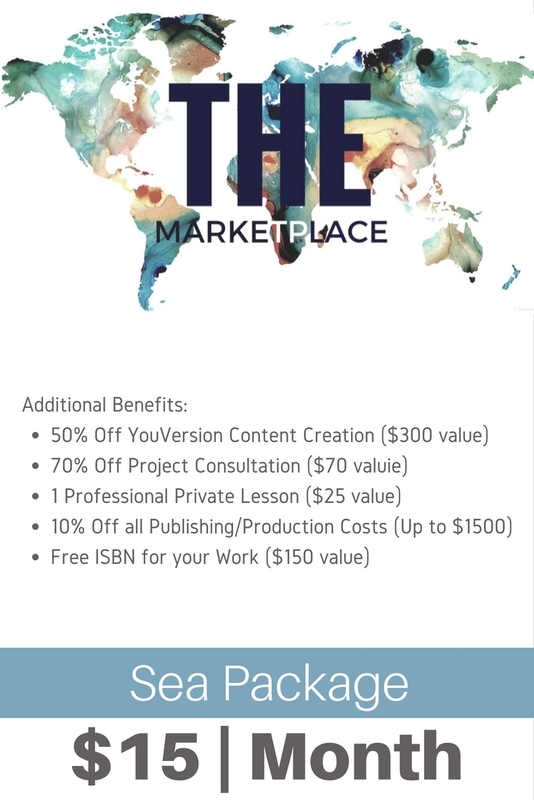 The Marketplace is a central hub to document, resource, share, network, and work together in creative projects that build up the local church and strategically help culture. Log your work for promotion or general sharing merriment, and those within your Zip Code, Region, or Interest can join you or become aware of all you do in and for the kingdom. Our Goal through The Marketplace is to see little "micro-networks" develop; working together like little cells in the Body of Christ. Creativity has a way of springing up within local and indigenous hearts, voices, and talents--capturing the kingdom nuance and flavor in each particular culture. We want to resource these local cells as they grow with greater promotion, funding, resources, and visibility through our own global network partners. Learn More & Log In Today. However, if you so choose, it comes with low monthly pricing options to eliminate huge costs to you in branding, marketing, publishing, and production. This enables you to see your idea through to completion with all the bells and whistles of the industry, minus the huge price tag. The true beauty of this Conference is realized when micro-communities of innovators are formed in local contexts and churches. We want to harness and equip the artist, the writer, the businessman, the politician, the musician, the father and mother, the Pastor, the missionary, and more, to gather like-minded individuals together (a Circle) in an effort to engage culture with gospel craft, character, and Christlikenss. Our Circles enable likeminded community to form with one another, along side one another, and toward those who have dire need for gospel renewal. Learn more about our Circles and start one today!